Today we celebrated Divine Liturgy (Holy Communion) in honor of St. Herman of Alaska, a monk missionary sent from Russia in the late 18th century. 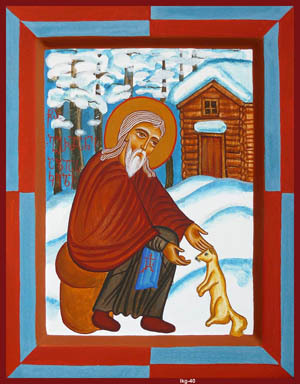 He was known to feed animals such as ermine and bears, as in this icon. The saint lived many years on Spruce Island, near Kodiak Island in the Aleutian group. Just hearing and thinking about the setting for his life and labors makes me shiver. I am such a lover of comfort! While I like to warm a rice bag in the microwave to put under piles of blankets at the foot of my bed, when the temperature outdoors is well above freezing, Father Herman would warm a board on the stove and use it for his only covering. Not cozy. But then, monks are known for seeking warmth not for their bodies, but in their souls, and they use their beds as reminders of the grave. Father Herman was beloved of the people of Alaska for his intercessions before the civil authorities on behalf of the Aleuts who were often mistreated and enslaved. He prayed to God and he served those thankful people for over 40 years. The icon is by L. Kintsurahvili of the Republic of Georgia. Saint Herman is such a special Saint! I like to stay warm too. God is so good to us in giving us such Saints! What a beautiful icon, it has an almost Coptic feeling about it. I can't get used to the new calendar! I remembered St Lucy but St Herman will wait for the 25th and we (all three of us) will remember him with salmon after the Nativity liturgy. Oh the confusion. Thank you for posting this, I love the colors and scene depicted in the icon. I believe I read something about Fr. Herman somewhere. I'm glad you brought him to my attention today. I, too, am a warmth and comfort girl. Thanks for the story of Father Herman–very interesting, and inspiring in these chilly times! How lovely to know of this saint — I'm afraid I'm terribly ignorant about so many. And yes, GJ, the frozen coconut is so much better than the other kind — at least I think so. It's not sweetened and tastes so much fresher.